"I caught you streaking in your Birkenstocks, scary thought, in the 2Ks"
Mirror Traffic is the new Stephen Malkmus and The Jicks album, recorded at LA's Sunset Sound Studios and at the home of the album's producer, Beck. With the question of a Pavement reunion having been triumphantly answered last year with an Ono-esque "YES", Stephen Malkmus & The Jicks return with their most energized set to date. These 15 songs range from hard-rocking political commentary ("Senator"), to touching, winsome folk ("No One Is"), to virtuosic but melancholy and contrite kiwi pop ("Stick Figures In Love"). The lyrics are as curious as ever but more meaningful than they have been since Crooked Rain, Crooked Rain. 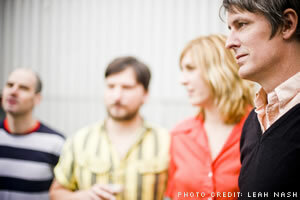 "This record," concedes Malkmus dryly, "is relatively approachable." As the first producer to work with Malkmus since Pavement, Beck has drawn out a set of performances that ring with clarity and inventiveness. Gone are the long guitar workouts and jams that marked the last couple Jicks albums, replaced with a sharply defined focus and more colorful depth of field. With nearly half the tracks clocking in under three minutes, Mirror Traffic flashes by with a lightness of touch; a decision that band and producer found easy to take: "Beck & I were both burned out on the heavy rocking style," says Malkmus, "and playing to the strengths of a melody felt like the way to go." 1) "I'm so psyched, this is the most Malk thing in years"
2) "I respect his right to make any record he wants, but this is the album that me and a lot of other people have waited 10 years for." For someone who has occasionally enjoyed a reputation for throwing ideas into the air and seeing where they land, Mirror Traffic is a confident, heartfelt, direct record. Ease into the seat and enjoy the ride.